New footage emerges of Jordan Pickford fighting NUFC fans in Sunderland – Watch here – NUFC blog – Newcastle United blog – NUFC Fixtures, News and Forum. 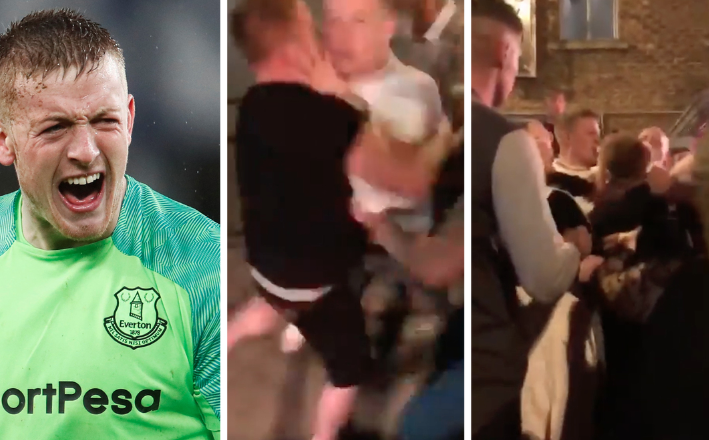 More footage has emerged following Jordan Pickford’s punch up in Sunderland over the weekend – with it now emerging that he gave an off-duty bouncer a black eye after scrapping with Newcastle fans. It seems he was followed around on his night out and goaded into a reaction, but what else does he expect when he’s gone out of his way to do something similar just about every time we’ve played Everton over the past two seasons? He can give it, but he can't take it..
Maybe it is sad that he can’t go out in his home town without being abused or mocked, but I don’t know what else he expects given the way he goes on at times. Remember when he sprinted across to goad the away end after Everton scored in our game at Goodison last season? Remember his antics at St James’ Park just a few weeks ago – a game that saw him almost calling fans out as he strutted off the pitch in defeat. The blokes chasing him about on a night out are petty, a bit pathetic and I don’t condone it, but it’s difficult to defend Pickford or have a great deal of sympathy given the way he’s handled himself when the shoe’s been on the other foot. “Mackem Borat” is thick as pig ****, seems that any advice given to him he is unable to understand, and Everton fans must cringe every time they see him.. I do honestly believe that if he doesn’t get help he is going to damage himself, or worse someone else…. I’m delighted that we don’t really have a Dyer, Bowyer etc who were on or close to the same level of ****ishness/thickness as Prickford is. Criticise modern prem footballers for living in Ivory Towers being divorced from the supporters then have a go when they go out in their home town? Can’t have it every which way, man. This is England, Tommy Turgoose! So how would fans feel if every time they went out for a beer some ****head started hurling abuse at them because they made a mistake doing their job? The behaviour of some fans at matches is borderline at best . Just because its a football match you are permitted to verbally abuse players on the pitch? THe same kind of behaviour off the pitch is completely unacceptable. I don’t know any Newcastle fans who would go out drinking in Sunderland, why would you?